Facts about Termites: Watch the provided videos, download the brochures, and visit the linked articles to learn everything you need to know to achieve successful termite control. The Eastern Subterranean Termite is the most common and most widely distributed termite in North America. It is a problem for home owners from southern Ontario in Canada, south throughout the Eastern United States and as far west as Montana. Swarming Eastern subterranean termites often swarm in the spring, but smaller swarms may happen throughout the summer and into the fall. Swarming may occur in the morning to early afternoon on a warm, humid day, especially after a rain, and may be extensive in a neighborhood. Interior swarms will many times be found near windows and doors, as the flying reproductive termites are attracted to lighted areas. Swarming inside a home almost always means the structure is infested and a pest professional should be contacted for an inspection. Termites are most visible to homeowners when they’re swarming. Still, termites can damage unprotected structures all year long. In fact, you could have an active termite infestation in your home and never see a swarm. Contact your pest professional to learn more about how to prevent termites from damaging your home. Subterranean termites are underground dwellers, just like ants. They are silent and generally invisible, and often go undetected until severe damage has occurred. While they live in the ground they are searching relentlessly for wood to feed upon, periodically returning to the soil for moisture, they work around the clock in their determination. Mud tubes indicate a travel path from ground to structure. Termites multiply rapidly, and by the thousands. Left undetected, they will cause major structural damage. Appetite Unlimited…Termites are voracious eaters of anything that consists of cellulose material – wood, paper, textiles, and animal products like leather. In other words, practically nothing that is not metal, brick or cement is safe in any building from the ever-hungry termites. 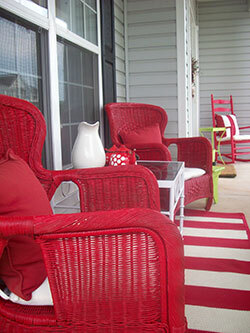 Unless termite infestation is prevented, it may become too difficult to salvage anything later. While Eastern Sub termite colonies are not the largest termite colonies you can find, there will often be more than one of them working in a single building. Signs of Easterns include dirt-colored tubes built to serve as protected paths from the earth to the wood the termites are feeding on, and the translucent wings shed by the kings and queens during swarming. Swarming usually occurs in the spring, but other, smaller swarms can occur throughout the summer and fall. Understanding these facts about termites helps in providing a higher success rate in termite control. An average Eastern Sub termite colony can consume 5 grams of wood per day, the equivalent of 2 1/3 linear feet of a 2’x4′ pine board annually. Eastern Sub termites can enter buildings through cracks less than 1/16″ wide. The termite colony is made up of different types (castes) of termites – each with separate work responsibilities. Although Eastern Sub termite colonies are largely located in the ground below the frost line, secondary colonies can exist above ground, and examples of true above ground colonies existing without any ground contact have been seen. However, such above ground colonies have access to moisture and often the source is a roof or plumbing leak. Eastern Sub termites will often build mud tubes for travel between their colonies and their food sources. Subterranean termites require moist environments. To satisfy this need, they usually nest in or near the soil and maintain some connection with the soil through tunnels in wood or through shelter-tubes they construct. These shelter tubes are made of soil with bits of wood or even plasterboard (drywall). Much of the damage they cause occurs in foundation and structural support wood. Because of the moisture requirements of subterranean termites, they are often found in wood that has wood rot. For more information, download the Termidor® Homeowner Brochure (.pdf). Fortunately, there is a solution to termite problems like those posed by Eastern Subterranean termite: It’s Termidor®, the world’s most amazing termiticide. View the entire Termidor® homeowner video. Tests have shown Termidor® to be 100% effective against subterranean termites, even in the most challenging situations. It will completely eliminate your termites within 3 months of application. No exceptions. No excuses. 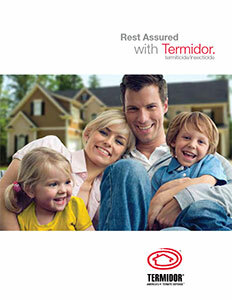 Only a Termidor® Certified Professional can treat your home with Termidor®. Termidor® is registered with the Environmental Protection Agency and can only be applied by a pest control professional who has been trained in correct application methods. Owner Ed Assidio is a Termidor® Certified Professional. A Termidor® Certified Professional is a licensed pest control operator who has completed the official Termidor® training program, passed a Termidor® certification exam, and been officially certified by BASF to use and apply Termidor®. If a termiticide is non-repellent, that means the termites can’t see it, smell it, or feel it. In fact, they don’t know it’s there at all. As a result, they’ll continue to forage in treated areas. That might alarm you, but it’s a good thing. Termites that are active in areas that have been treated with Termidor® are helping to spread Termidor® to more termites; they are, in fact, helping the termiticide do its job. Rest assured that in a short time all the termites-those you see and those you don’t-will be controlled. First, Termidor® kills termites when they eat it (and since they don’t know it’s there, they readily ingest it along with the wood fiber and other material they typically eat). Second, Termidor® kills termites that simply come into contact with it. So, even if your termites are not feeding, Termidor® will kill them. Termites that come into contact with Termidor® will also carry it on their bodies. 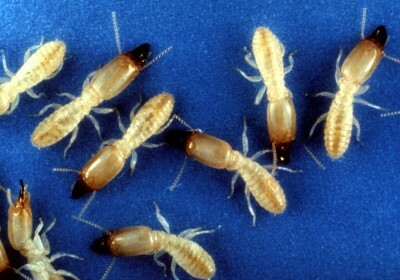 As a result, every other termite they contact, feed, or groom will also be exposed to Termidor®. All these termites will in turn transfer the termiticide to still more termites. This will go on for several days, allowing Termidor® to be spread throughout the entire colony. This unique mode of action is known as the “Transfer Effect™”. The active ingredient in Termidor®, fipronil, is slow acting. That’s a very good thing for you, and a very bad thing for the Eastern Sub termite colony. Why? Because Termidor® remains active long enough for one termite to transfer the termiticide to a large number of other termites in the colony before dying itself. And although Termidor’s® effect on individual termites is intentionally slow, the overall impact on the colony is fast. : it can be 2-6 times faster than bait systems. Certainly, every home is different, so the specifics of your Termidor® treatment and results will depend on your home’s age, configuration, construction and level of infestation. Your Termidor® Certified Professional will explain the best procedure for your situation. The entire application program is typically complete in a day or less; however, you may see some evidence of termite activity for several days afterward. That’s okay. Rest assured that Termidor® is working, and its unique ingestion, contact, and “Transfer Effect” will eliminate termites from your home. Remember, responsible termite control demands periodic inspections by a licensed pest management professional. Whatever the species, Termidor® termiticide insecticide is your answer. Want to know more facts about termites? These are only the highlights. There’s much more to the remarkable Termidor® story than we can include here. If you’d like additional in-depth information about Termidor® and why it’s the best solution for your home, download our comprehensive Termidor® Homeowner Brochure here…or see the Termidor® Homeowner videos below. In this 11-Minute Video, you’ll quickly learn why over 3 million homeowners have trusted Termidor® to provide peace of mind when it comes to protecting their homes from termite damage. Does Termidor® sound like the answer to your termite problem? If you have any questions on facts about termites, give us a call and we’ll be happy to help.